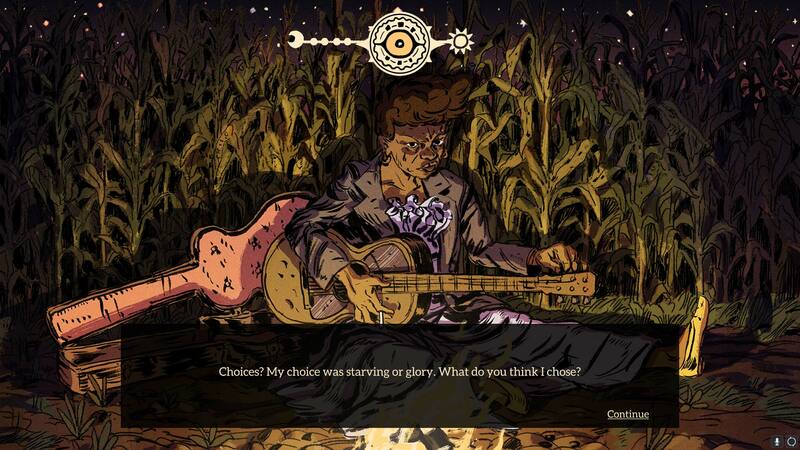 Where the Water Tastes Like Wine (from Dim Bulb Games) is more American than apple pie. That’s because it shows the whole pie, mealy apples and all, which makes for an incredible gaming experience that’s unlike anything else I’ve ever played. While it suffers from some repetitive gameplay elements and technical mishaps, WTWTLW is still a must-play for anyone who likes story-driven games. You’re trying to hail a cab on the streets of Boston. When you do manage to flag down a car, you sit in silence as the cab winds through the Boston of some past decade: the 1910s, maybe, or the 1940s. You can’t be sure, and it doesn’t really matter. When you reach the train station, the cab driver turns around and predicts your future. The next day, you hear the same story from someone on the train to Miami, except now the cab driver will tell you exactly how your life will unfold in the next year. A week later, while you’re hitching a ride to New Orleans, your lift tells you that the cab driver explains the next twenty years. Your storytelling friends all think this is mighty odd, but they don’t seem to care that you’re a sentient skeleton the size of a house, whistling as you balance a bindle on your shoulder bone. Welcome to Where the Water Tastes Like Wine, a slice of weird Americana where stories are like seeds that take root and grow into strange blossoms. You play as their unlikely gardener: a gambler who’s lost a game of poker with the Dire Wolf (voiced by Sting – yes, really). You’re in Wolf Sting’s debt, and he collects by stripping you of your flesh and having you travel across the United States of America, where you pick up stories and tell them to a collection of travelers you meet along the way. You can cross states in giant leaps and bounds, hitchhike across desert highways, and hop trains between cities to get around. Along the way, you’ll see icons that indicate stories or opportunities to earn money. You’ll also see campfires, which indicate characters you can interact with. The game only has two real mechanics: telling the kind of stories your traveling companions ask for and trying not to die. You die if you run out of health, which you lose if you get caught hopping trains or beaten up by thieves. It doesn’t really matter if you die though, you end up going back to the Dire Wolf who sets you back upon your path. The stars of the show are the game’s traveling companions, whose stories are beautifully written and masterfully acted. You spend a night by their campfire and try to tell them the stories you think they’d like to hear, and in return, they tell you about their lives. The companions are as diverse as American history. Rocío is a Latin American migrant worker sending money back to her young son; Jimmy is an African-American traveling preacher who isn’t sure he believes in God; Rose is a washed-up hippie who never found the commune where she belongs. WTWTLW isn’t afraid to tackle racism, sexism, classism, and all the other -isms that have forced people out of their homes and onto the road, and the game is better for that. Each character’s story is written by a different author, which means that the game writing itself has as many voices as the map of the United States. Some of my favorites were Althea, Cassady and Dupree. And as for the actual voices: the game has some of the best voice acting I’ve ever heard, second only to Mass Effect (a project with way more money and manpower than WTWTLW). The characters are drawn in storybook, pen-and-ink-style 2D illustrations that fit the game’s tone perfectly. The skeleton and map, however, are blocky, stylized 3D which creates a disconnect between the two modes of play. I wish there’d been more of an attempt to tie these two styles together. What does a better job at setting the mood, though, is the deeply satisfying soundtrack. 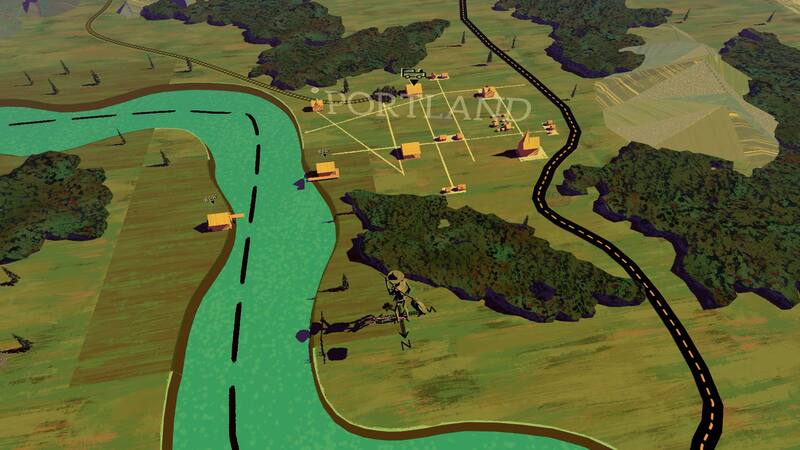 It jumps from jazz to drum-heavy folk music as your skeleton crosses regional lines. The game’s theme, “Vagrant Song,” has many different versions and it changes depending on the setting. Some are sung by women and some by men. One is sung in Spanish. Some are slow, while others are up-tempo. (My favorite? The Midwest “Vagrant Song,” which features a hammered dulcimer, flute, and a high, pure, female voice.) The songs are earworms: I kept finding myself singing “Vagrant Song” while I washed dishes or folding clothes. WTWTLW is set during a depression, but it’s not the Great Depression. The game is timeless in the sense that companions and stories are drawn from every part of post-1900s America. Cassady is a beat poet (1950s), Rose followed the Grateful Dead (1970s), and Franklin is a Pullman porter (1920s). The cotton field workers could be singing a song in the 1910s or the 1940s. That taxicab from Boston could be from the 1930s or the 1980s. This timelessness feels weirdly profound: it suggests that the past is never past, but is always unfolding around us, aftershocks from this war or that presidency intersecting in ways we never saw coming. Even with all the game’s beauty there is still plenty to roll your eyes at when it comes to the technical side of things. When I played, several weeks after the game’s release, I encountered bug after bug. I died every time I hopped a train to Charlotte, couldn’t exit the large city menus, and felt like I was going to throw up after the third-person camera spun me in endless circles for five straight minutes. Many of these bugs are now fixed, and the creative director, Johnnemann Nordhagen, has been constantly responsive to bug reports on his game’s Steam community boards. Even with ongoing fixes, the camera is jerky and prone to freezing, and I experienced much more lag than I would have expected on my gaming PC. Sometimes, just loading into the game took a half-minute or more. WTWTLW also features some odd interface and gameplay choices. It took me over five hours of gameplay to realize that I had an inventory, where I could switch the active stories I’d collected, view a map of character locations, and check my progress. All stories were sorted into moods – hopeful, scary, sad – but the game doesn’t tell you the mood of each story before you retell it at a campfire, and some of the choices seemed bizarre. Stories I’d expect to be scary would end up classified as funny or vice versa, and I ended up with far more scary and sad stories than any other category. In addition, when I reached the final stage of the game and had traveled the entire country several times, hunting down those final stories started to feel like slow-mo whack-a-mole. “Can’t you go faster?” I’d mutter at the skeleton, who’d amble through Maine only for me to realize that I had indeed found all the stories in Maine. 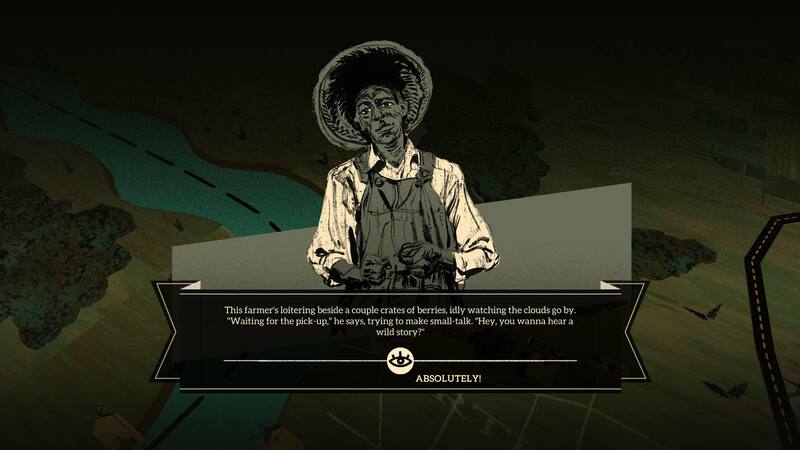 I never did find the place where the water tastes like wine, though I have some guesses. Still, as the Dire Wolf suggests, maybe the place where the water tastes like wine can be anywhere on a journey. It felt like that every time I sat down with one of the beaten-down but resilient characters, all of whom were stretching their hands towards some version of America they had been told they could find. And many of them found it, or something like it, by the end. Days later, I’m still thinking of heartbroken poet Cassady, traveling through the Midwest and trying to write his vision of the nation into existence. He’s sad but hopeful. When he talks, I feel like I’m really there with him. “We do reach up like that,” he says, “towards hope,” and in his voice I hear a hint of the place where the water tastes like wine. GoGcast 60 – Patric from @BorealysGames – Exclusive Pre-Alpha footage of Mages of Mystralia!